Get ready to have a Monster of a time! Monster Jam, the ultimate monster truck show, is coming to Oakland's Oracle Arena on February 22, 2014. Alfie took the kids to Monster Jam several years ago, and they all loved the show. They came back full of superlatives -- cool, amazing, loud, fun, great -- and couldn't wait to watch it again. This year, they're getting their wish, because Feld Entertainment is sending us to the show! When Jammy found out, his eyes lit up and his mouth widened into a grin, and he said, "Ooooh, I can't wait to see the car that turns into a robot, mom. It's the coolest thing ever, just like Transformers, but for real! You're going to love it, mom!". With that kind of endorsement, how could I not look forward to Monster Jam? Keep reading for a description of the show, some Monster Truck trivia, and a discount code good for $5 off show tickets! Monster Jam is the most exciting form of family motorsports entertainment on the planet. The stars of the show are the biggest performers on four wheels: the Monster Jam trucks! The twelve-feet-tall, ten-thousand-pound machines will bring you to your feet, racing and ripping up a custom-designed track full of obstacles to soar over - OR smash through. The 2014 touring season brings more Monster Jam excitement providing entertainment tailored perfectly for your family's budget, and these colorful, larger-than-life beasts are sure to capture the hearts of both young and old. Monster Jam® Trucks: Grave Digger® driven by Charlie Pauken, El Diablo℠ driven by JP, Mohawk Warrior® driven by George Balhan, Lucas Oil Crusader® driven by Linsey Weenk, Captain's Curse driven by Alex Blackwell, Metal Mulisha driven by Todd Leduc, New Earth Authority℠ driven by Norm Miller, Shocker driven by Pat Gerber, Captain USA driven by Travis Groth, Double Trouble driven by Tyler Groth, El Toro Loco® driven by Dan Rodoni, Tropical Thunder - driver TBA, Devastator driven by Mark Schroeder, Time Fly's driven by Kelvin Ramer, Detour driven by Garrett Ladelle and Titan driven by Donald Epidendio!! Subject to change without notice. Today’s Monster Jam® trucks use lightweight bodies and tires so more strength and weight can be put into the frame without sacrificing speed, maneuverability, or safety. 1. Body – Made of fiberglass, a Monster Jam truck body is custom designed to create a character or theme for the truck. Custom body trucks can be carved by hand out of styrofoam and wood to create a “plug” which is then used to create a fiberglass body mold or created by computers. 2. 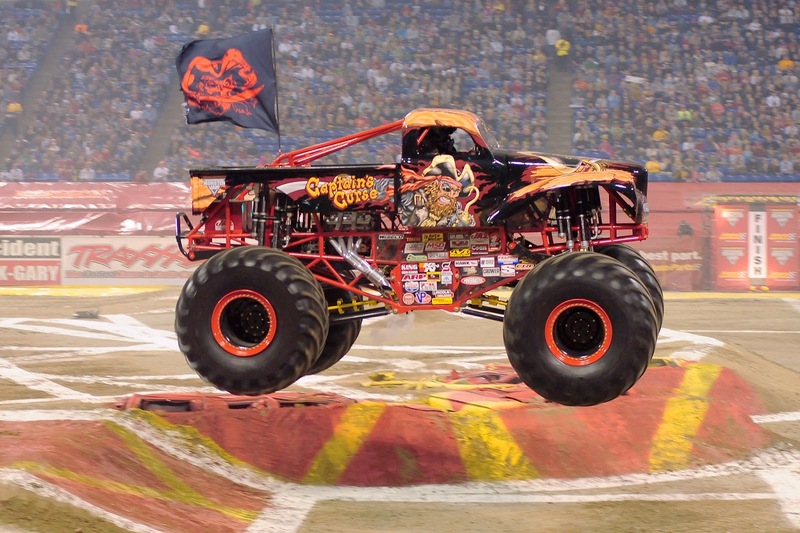 Driver Seat – Most Monster Jam trucks have the driver seated in the center of the vehicle so he or she can best see the track for weight distribution. The seats are custom molded to each driver’s body and all drivers use head and neck restraint devices to keep their heads secure during rough landings. As a safety measure, all seatbelts employ a 5 point harness to restrain the driver’s body. 3. Paint – Most Monster Jam trucks feature highly designed, customized airbrushed artwork on their bodies. Airbushing is expensive and time consuming as some trucks require more than 40 hours of paint time. Monster Jam body fabricators are always assured lots of work though, as their custom creations are routinely destroyed during the shows. 4. Engines – Custom-built, supercharged and methanol-injected, a Monster Jam truck engine burns up to 10 liters of methanol per run (approximately 80 meters) and delivers about 1,500 horsepower. 5. 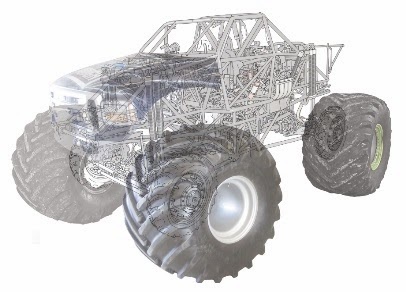 Suspension System – In order to allow the drivers to withstand the punishing impacts of jumping and crashing a Monster Jam truck during a performance, each truck is equipped with specially-engineered extra long 76cm shock absorbers filled with oil and nitrogen gas that are installed with each tire. 6. Tires – Each Monster Jam truck tire is custom made. They must be 66 inches high and 43 inches wide. The average Monster Jam truck team will go through 8 tires in one year. Tires are designed differently to satisfy various track conditions and driver preference. Carving just one tire requires over 50 hours of exacting labor. Save $5 on normally priced $25 tickets with code MOM. Savings not valid day of show. Disclosure: I am a Feld Family Ambassador, and in exchange for my time and efforts in attending shows and reporting my opinion within this blog, as well as keeping you advised of the latest discount offers, Feld Entertainment has provided me with complimentary tickets to Feld shows and opportunities to attend private Feld pre-Show events. Show information (in italics) is provided by Feld Entertainment The views and opinions expressed here are my own.